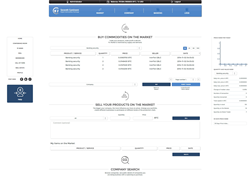 Global marketplace of products and services Seventh Continent reported important increase in user activity, claiming that traders carried out more and larger transactions since it was launched last November. The operator told CoinTelegraph that the Bitcoin denominated Market completed roughly 5000 transactions daily this month. Founder and CEO Gregory Harmati also confirmed that usage has increased; the main reason he offered was that users are registering many new companies and amassing resources for their businesses ahead of policy changes announced recently, to attract more serious traders. As a matter of fact since October the marketplace has added to its profile fifty new activities, thus requesting larger investments from 15 BTC (a Bitcoin worth approx. 400 USD today) to as high as 2,471 BTC. If investment amounts seem overzealously high for an international exchange in its early days, profit, the counterpart of wisely placed investments tends to show fair enough figures: on an average a company on Seventh Continent breaks even after two or three production cycles. A production cycle matches with the minimum quantity of products manufactured with a freshly raised business. Nevertheless depending on actual demand many companies were in the black after the first production cycle realizing on average 27.8 BTC within 1-2 days, operator TechBay reported. Bitcoin-based exchange Seventh Continent allows users to trade “digital” products and services in a fair and transparent business environment where the unique rule of success is set forth by supply and demand. Businesses on Seventh Continent produce their own goods and sell them to other users’ companies in need of resources. In a closed circle of production and trade this new marketplace offers a real economy denominated in Bitcoin; each business hooped through its own activity is connected to the others in an endless chain of production and speculation. Is this a game for punters? Not exactly; an independent observer would more opt for a skill-based Exchange where everything is for sale, from products, services, commodities, even to stocks! Companies registered on Seventh Continent are “virtual” or more precisely, not registered on any of the other six continents we know, hence the easy and instant registration process. Two advantages also distinguish this exchange from those venerated ones. Transparency would be the first, since over the counter trading is not possible; the alleged absence of price cartels is the second, as any new business in any branch is able to bounce back price speculations and lower the profit margin so eloquently negotiated with the cartel partners. Commodities, products and services traded on Seventh Continent are not real but they are not virtual either. What the founders call “digital” products and services refers to goods sold for digital currency, just like e-products downloaded from an online shop. There is a slight difference however; it is possible to resell digital goods on Seventh Continent and speculate on the price denominated in cryptocurrency, a money easy to convert to any fiat currencies in the world. This is not a virtual cow bought for hard cash in a Facebook game, money spent on futile entertainment, rather a “digital” product having a defined value expressed in Bitcoin other users would buy. But there is more to Seventh Continent than meets the eye. A free of charge USD Bitcoin exchange, Hall of Fame, analytics, internal mailing system, an entertaining user interface including voting features for raising capital, paying dividends or simply dismissing a friend afraid of staying in a managerial position too long, and last but not least a referral system called ironically “Sponsorship Program” by the founder; whatever the mismanaged investment losses will total, after each financial engagement to create a company from referred new users a commission is paid to meet months end. Seventh Continent is not only for Bitcoiners; another part of its appeal, let’s face it, is its beauty. If a newcomer doesn't know how to tame Bitcoins or never had a Bitcoin wallet in the pocket, can still start a business on the new continent and his or her Dollars will instantly be exchanged to Bitcoins, credited to the account within 1-2 days. Even the most distrustful will become fans of Bitcoins, as this new money system is the fastest, most secure and easiest payment system today, a legal tender free of charges. As a matter of fact Seventh Continent doesn’t charge fees on deposits and withdrawals; but as this is no mere hobby, the operator’s income is realized from a transaction fee of 0.7%. “Bitcoin is used and valued by a constantly enlarging community, and Seventh Continent intents to provide it the first economy, a market for Bitcoin users looking for fair trade, profit making, and privately run independent businesses”.